13 October 2007. 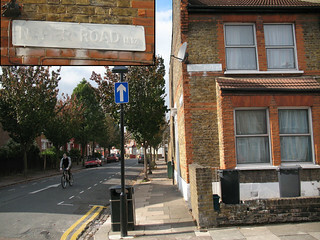 A street-name sign in Napier Road N17. § Nothing to do with street signs, but anyone curious about Napier Road Tottenham may like to read about Grace Baptist Chapel situated at the fork of Napier and Ranelagh Roads. The website has lots of detail, including its history dating back to 1884. That sign’s clearly been painted over with white paint. Thank you for your email dated 14 October 2007 regarding the street name plates at the above locations. I am pleased to inform you that an order will be raised by the end of this week to replace existing street nameplates. Please be advised that this may take up to 6 weeks for receipt and installation of the new nameplates. So why exactly is there a CPZ in Bruce Grove. Haringey Council up to their old tricks again? MarieLyn, I’ve no doubt that parking restrictions were needed in many streets in Bruce Grove where residents could no longer park. That’s what the consultation showed. In the photo (Loxwood Road) you see empty spaces along blank walls and fences. Which is not surprising since most people like to park outside their own home. Cars parked where there’s nobody overlooking are also more at risk from thieves. In my comment about displacement I had in mind that a lot of cars previously jamming streets – for example, near Bruce Grove Station – may now be elsewhere. But a CPZ here also stops parking if cars aren’t taxed or insured. There’s an issue about the hours a CPZ needs to be effective. In some places, two hours in the day is enough to stop commuters driving there and catching a train into central London. Trouble is, the present legal and consultation arrangements aren’t flexible enough to let you change easily if two hours doesn’t work. Hi, I’m an admin for a group called London Street Names, and we’d love to have this added to the group! Thanks Alan for adding this and joining our little group.